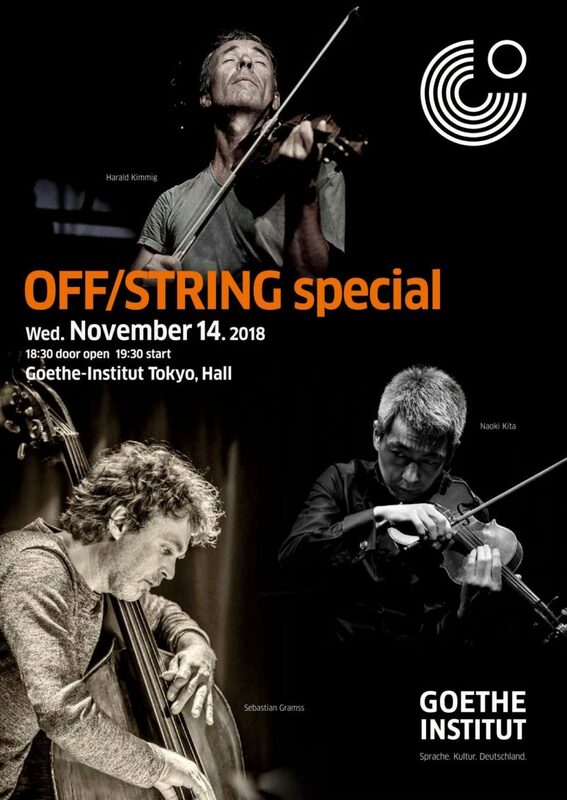 Sebastian Gramss, representative figure from Cologne Jazz scene, and Harald Kimmig, conspicuous improviser and violinist, were invited to Japan by the prominent violinist, Naoki Kita and toured as a trio unit “Off/String”. 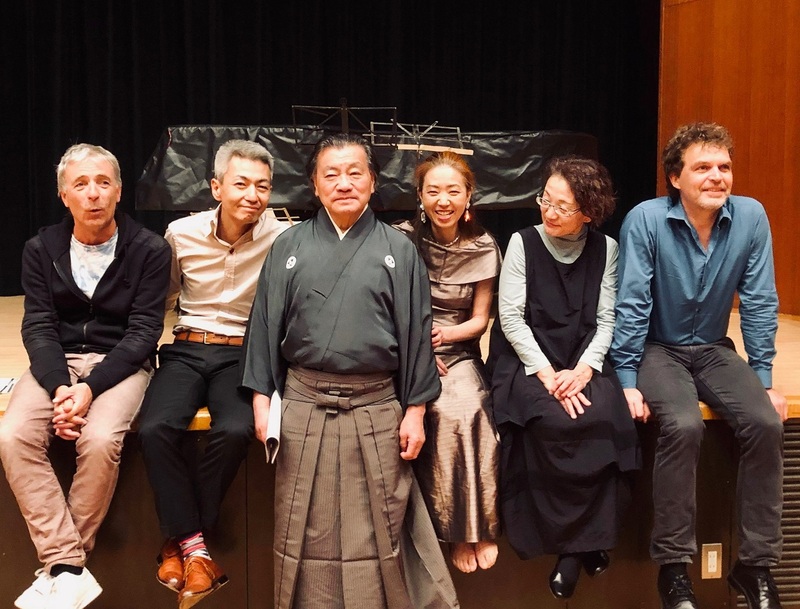 At this closing concert of the tour, three experienced Japanese musicians who have a certain kinship with Kita—Kyoko Kuroda(piano), Shunichiro Hisada (kotsuzumi & utai), Taiko Matsumoto(vocal)—joined in the performance. Needless to say, each and every one of them is outstanding figure in the field and has established strong musical view respectively. Their interplay is spontaneous, but never loose intensity of tension at any time. The fact that they thoroughly know their own music is emerged as tolerance to others. Harmonizing, counteracting, urging, and sometimes outwitting each other, ultimate forms of emsemble shows up. The music is full of generosity, but there is no slacking moment. 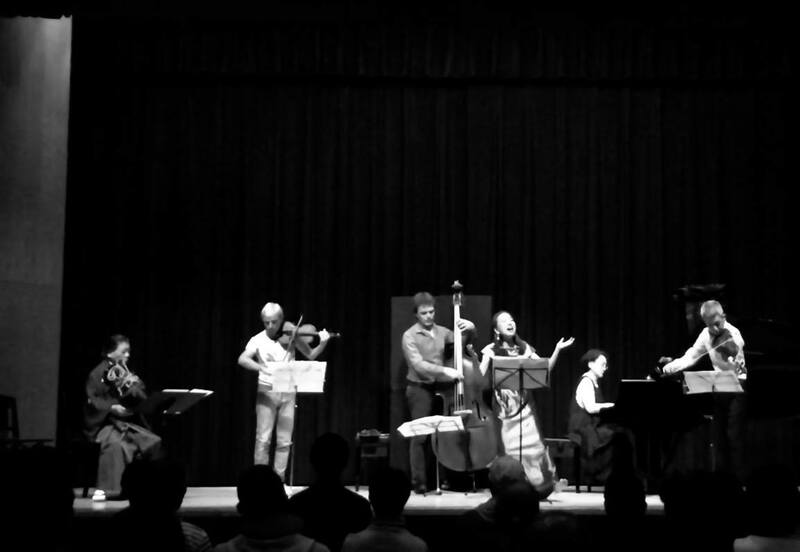 In the first part of the stage, full improvisational sessions continued changing formations (each set took a couple of minutes to circa ten minutes). Followings are my sketches of each set. Tones are not ‘released’, remained to be under the control of the players. Equilibrium between oscillation and absorption, plucking and bowing. Hisada’s existence branched off two directions; one was by his ‘kotsuzumi’ in response to percussive approaches of piano and noises of strings, another was by his ‘utai’(recitation in Noh) harmonized with melodious development of strings. Tones ‘picked up’ by all possible means. Starting from inside piano, versatile ‘concealed voices’ against gravity of instruments never ceased to attract the ears of the audiences. However, tense surface of music kept the contradiction of amplitude; both flexible and solid textures were enlarged as if they were scooped out. 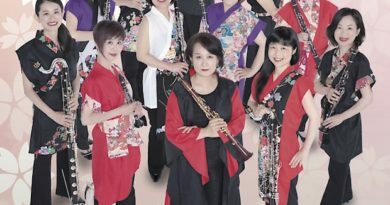 Gradually “kotsuzumi” increased the degree of noise, was entwined with violin, and turned into together strong undulation. 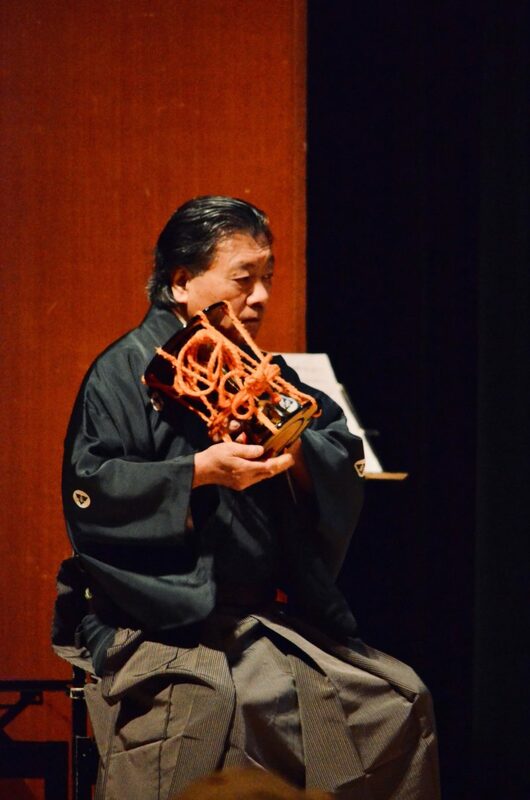 It was fresh to hear that ‘utai’, a traditional recitation in Noh theatre, was accompanied by contrabass and violin. 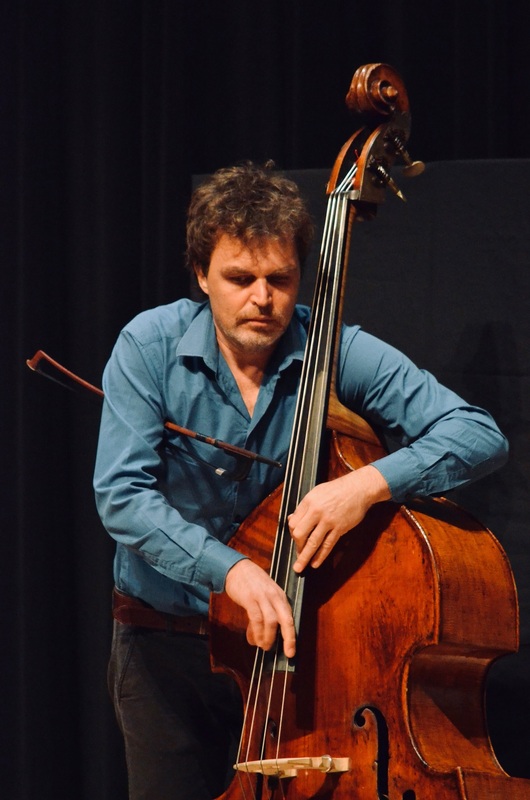 The direction of musical flow was set by contrabass’s warm basso-continuo. 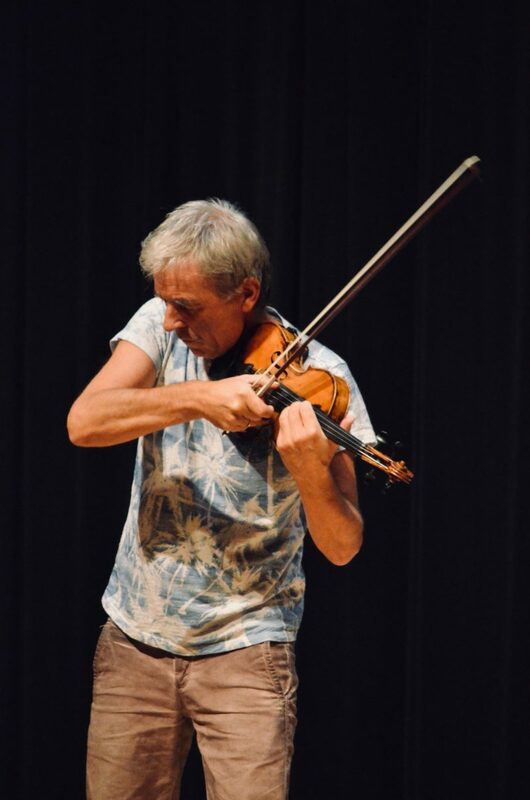 Three instruments were perfectly harmonized like trinity, but the attribute of each usage was simultaneously emphasized; metallic texture generated by violin, melody unexpectedly appeared from the very bottom of the huge body of contrabass, etc. Overall, this session was brimmed with matt and earthy driving force. Triggered by the count in German by Kuroda’s voice, a sequence of multi-layered fragments turned exhilarated chamber music before we noticed. Kuroda and Kita, who positioned on the right side from the auditorium, had a goof chemistry reflecting upon their long years’ collaboration. 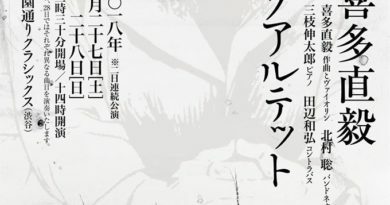 Kuroda’s piano functioning as a counterpart of expansion and shrink executed by two violins, showed flexible conversation on the surface, flashed at the same time huge abyss of the silence hidden behind—its nuanced emptiness was lyrical but shivering. 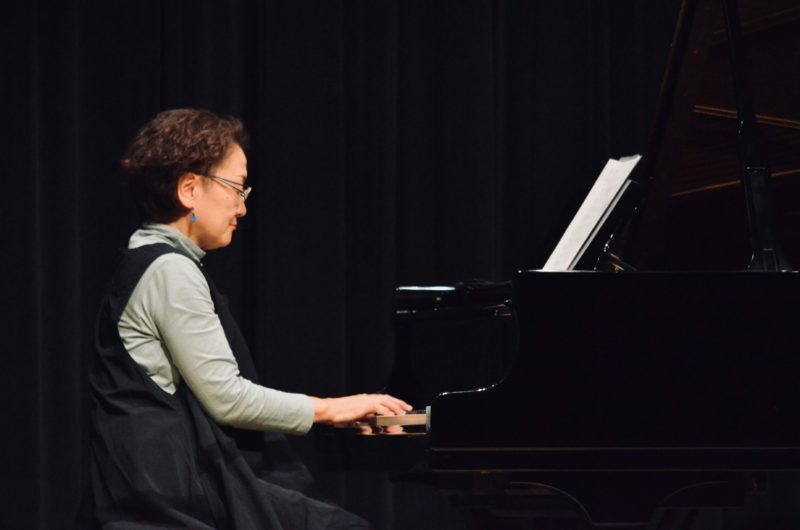 Originally, one of the most distinctive features of Kuroda consists in her versatile colorful tones, but in this case, she dared to contain coloration and constructed a good perspective including her skillful percussive approaches. Starting from solo play of Hisada, three strings (Kita, Kimmig, Gramss) merged respectively, synchronized with “utai”. 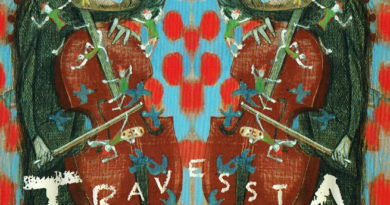 Gramss’s riffs played with strong finger stroke moved the music to its foundation. In the climax, each instrument roared their dynamic voices, where even ‘noises’ were converged with organic consequences. 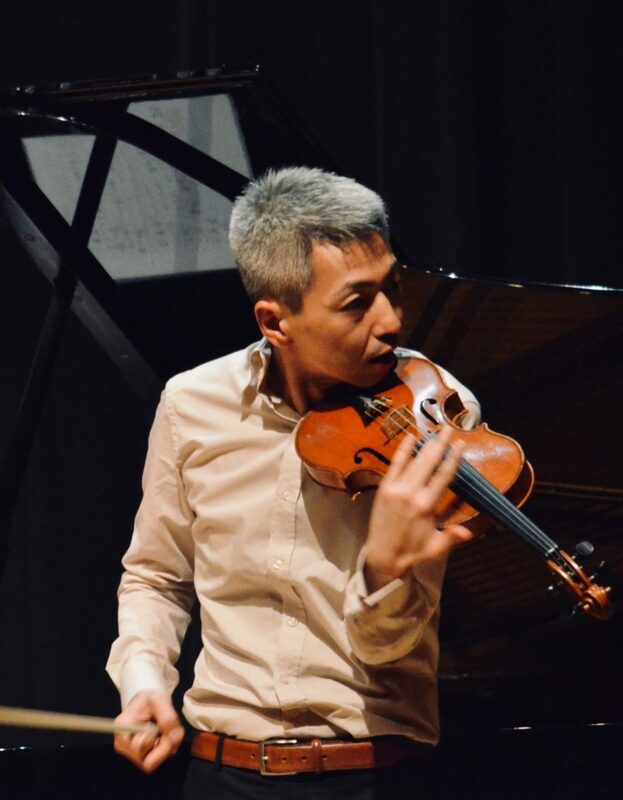 The second part was composed of four tunes including those of original organizer of this project, Tetsu Saito, who set contemporary poetries to music. 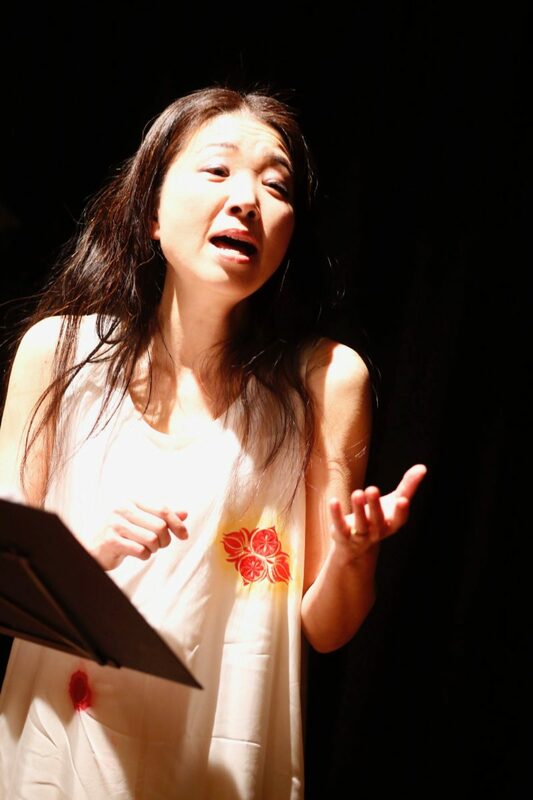 From here, Taiko Matsumoto(vocal) came into the act.